1. Heat the oil in a large pan and cook the onion and ginger for 5 minutes until softened. 2. Add the lamb and curry paste and cook for a couple of minutes more, then stir in the tomatoes, potatoes and 300ml water. Bring to the boil and simmer for 40 minutes until the lamb is tender. 3. Divide between bowls and scatter with the coriander leaves. 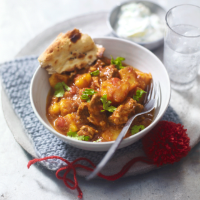 Serve with a lemon wedge for squeezing over and warmed naan bread. This recipe was first published in Thu Dec 11 14:54:00 GMT 2014.